5 Super Easy Recipes - Tastee BQ Grilling Co.
Burgers And Beyond! 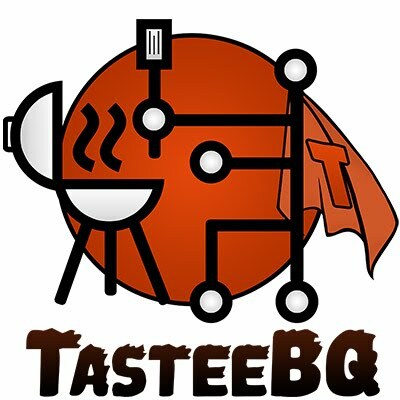 TASTEEBQ Goes to the Super Bowl!! Our hero TASTEEBQ was called to the Rescue by Jill, a Damsel in Distress. Tired of frozen burgers and salty hotdogs for Super Bowl, Jill was determined to do something more exciting on the Grill. Plus, some of Jill's expected guests were from the Tribe of Vegan. But…What to Make? And How? Help!!! Hearing her distress from far away TASTEEBQ answered her call. …Using a powerful Distance Connecting Voice Module (some may call it an iphone). On a lifelong Mission to defeat his longtime arch-nemises Boren'GFood, our Hero is always happy to lend a hand. He flew to Jill's lair immediately and was amazed to see her Pantry, which contained everything needed to make Five SuperEasy SuperBowl Recipes for the Grill. This great fortune always seems to shine for our SuperHero. Mere Mortals may need to retrieve some of these items from their Local Food Exchange. [Hint- look for Yellow Items throughout story for your Shopping/Supplies Lists. In a Snap!, TASTEEBQ was able to help Jill make a truly Heroic Menu. Her guests were overjoyed to consume these delicious morsels, which miraculously disappeared as fast as they were served. With an assist on the Grill from her husband Jack, both hosts became Legendary Heroes in the eyes (and stomachs) of all their friends. They even scored points with the Vegans, which can be quite the challenge. TASTEEBQ flew to the Pantry for one simple ingredient- Kettle Cooked Potato Chips. Jack preheated the Grill coaxing it to full smoke after adding soaked Wood Chips to the heating element. He evenly layered Potato Chips across bottom of a Foil Pan, leaving space for the smoke to circulate. Smoking on low indirect heat for 8-15 minutes, Jack watched carefully (for Chips not to burn) and tossed them with Tongs once or twice to circulate flavor. Serving them hot, the guests really dug these Chips with French Onion Dip. -While hot, serve and enjoy. Guests will really dig these with a cool Dip. Our Hero had the couple grab a bag of their favorite Tortilla Chips and choice of Toppings, and assured them: "This will win Big! every time in the game of Grill vs. Microwave." From the pantry they extricated: Tortilla Chips, Cheese, Salsa and a variety of Toppings which can include: Chopped Onions, Tomatoes, Jalapenos, Black Beans, Sour Cream, Guacamole and Bean Dip. In nearby Galaxies, humans are known to also add Taco Seasoned Ground Beef, Cooked Chicken, Steak Bits or Crispy Bacon. Jill layered the Tortilla Chips evenly across the bottom of Foil Pan. Then she sprinkled with one layer of Cheese to help prevent the Chips from getting soggy. Next, she spread Black Beans (or Bean Dip), then- Chopped Tomatoes, Onions and a second Toppingof Shredded Cheese. To the Grill! The Chips were smoked on low indirect heat for 12-15 minutes. 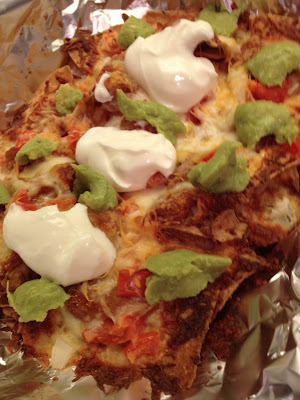 Guests were able to top their own Chips with Scoops of Sour Cream and Guacamole. They also had a choice of Mild Salsa, Jalapenos and Cholula Hot Sauce. - If using Black Beans or Bean Dip, spread evenly over Tortilla Chips. May also add Meat here, as well. - Carefully remove from Grill with Oven Mitts. Warn guests if cooked on hot tray. If kids have access, you may want to gingerly transfer Chips to cooler serving platter. - Top with scoops of Sour Cream, Guacamole. - Serve with Salsa, Jalapenos and (optional) Meat Topping on side if some guests are Vegetarians. Happy to spy several glorious heads of Romaine Lettuce in their home Cooling Closet, TASTEEBQ advised the hosts in an earnest voice: "Serve that store bought tray of Precut Carrots, Veggies and Dip if you must. But beware falling into the clutches of the evil villain Boren'GFood. To defeat him, you should toss the Veggies on the Grill for few minutes, sprinkle with your favorite prepared Dry Grill Seasoning Mix (or Rub), then return them to the Platter around the Dip.” [< Bonus Recipe Alert!<<]. He added: “In this Modern Age, guests with Vegetarian and Gluten Free tendencies will appreciate the extra effort. From what I hear, the Tribe of Vegan can get downright hostile if confronted with a cold storebought Veggie Platter as their only option. They usually can't even partake in the Dip. with olive oil and Grilled them for about 5-7 minutes (until lightly carmelized). Then they chopped all 4 Romaine Heads into 1 1/2 x 3 inch squares, mixing the Fresh and Grilled Lettuce. Jack tossed in Caesar Dressing, Croutons and Parmesan. They even put Chopped Fresh Basil and Cherry Tomatoes on top for even more flavor. Parmesan Cheese- 1 Cup shaved or grated, as needed. - Rinse and dry one Head of Romaine, cut in half, drizzle with olive oil and grill for about 5-7 minutes until lightly carmelized. Set aside to cool. - For each carmelized head, clean and dry one Head of Fresh Romaine. Chop Lettuce into 1 1/2 x 3 inch squares, mix Fresh with the Grilled Lettuce. 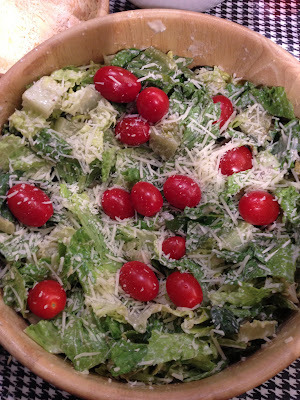 - Toss with desired amount of Caesar Dressing, folding in some of the Basil and Parmesan Cheese. - Move to serving Bowl, sprinkle with more Cheese. Add Tomatoes for color. - Top with Croutons and a final dusting of Cheese with the Chopped Basil. - Split a roll of French or Sourdough Bread in half and spread with Garlic Butter or Herb Seasoned Olive Oil. - Grill on low heat for about 6-10 minutes, till toasted. - Let cool slightly and chop Bread into 1 /2 inch squares to set aside. Gluten Free (GF) Alternative- Grill GF Bread and cut into cubes or use cracked GF Crackers. Or just skip Croutons, altogether. Also, make sure Dressing is Gluten-Free. TASTEEBQ commandeered the use of a Ziplock Bag, and seasoned the Precooked Wings with Dry Grill Seasoning. Then they Grilled the Wings on low indirect heat, for approx. 15-20 minutes, adding Wood Chips for smoked flavor. [Shortcut>>>] Start with pre-cooked wings from the grocery Deli Section. Don't Pass "Go". Proceed directly to Grill. - Generously marinate Wings with Grill Seasoning, set aside for at least 1/2 an Hour. Overnight is even better. “For Buffalo Wings- Toss Wings in Franks Hot Wing Sauce, garnish with Carrot and Celery Sticks. For Barbecue Wings- Toss Wings in your favorite Barbeque Sauce, garnish with Grilled Texas Toast. Serve wings with Bleu Cheese and/or Ranch Dressing for dipping. Worcestershire Sauce. Then they separated the meat into small Patties and Grilled for 10-16 minutes, depending on heat and desired doneness. Flipping Burgers at 4-7 minutes, they added a really good gourmet Cheese halfway thru second side. After also Grilling the Mini Hamburger Buns, they allowed guests free will to choose from a vast array of Burger Condiments, including Tomatoes, Lettuce, Onions, Pickles, and Jalapenos. Also there were a variety of optional Sauces- 1000 Island Dressing, Herb Mayo (Mayo mixed with Dry Garlic/Italian Seasoning), Barbeque Sauce, Stoneground Mustard and Ketchup for the kids. - Season Beef with Salt, Pepper and Worcestershire Sauce. - Massage seasonings evenly into Meat. Separate evenly into small balls to make Patties. - Keep Meat chilled until ready to cook. - Flip Burgers at 4-7 minutes depending on desired doneness and heat of flame. - Add Cheese halfway thru second side. - Serve immediately or allow Patties to rest a minute on Sideor Serving Plate. - If using Instant Read Thermometer Rare is 140, for Well Done 170. - A Nifty Trick for doing Patty Platter is to put Rarest to the right, Medium in the middle, moving Well to the left.